Pascal Hachem, back to square one, 2017. Irons, flour, metal structure, step motor and electrical board. Photograph by Andy Stagg, courtesy of The Mosaic Rooms. Pascal Hachem, left under, 2017. Wooden brushes, metal structures, step motor and electrical board. Photograph by Andy Stagg, image courtesy of The Mosaic Rooms. Pascal Hachem, the stone in my pocket, 2017. 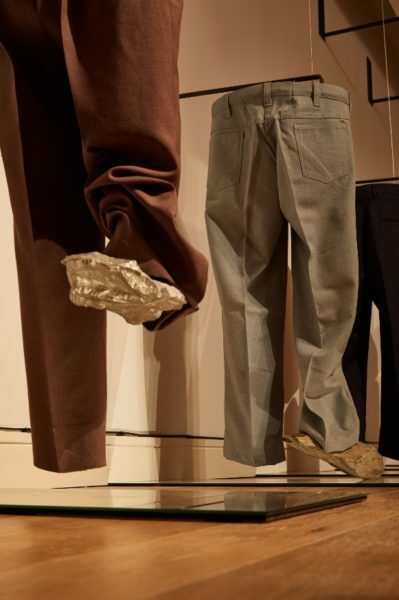 Trousers, stones, metal cast of stone, mirrors, metal cables, metal structures, step motor and electrical board. Photograph by Andy Stagg, image courtesy of The Mosaic Rooms. Pascal Hachem, who carries whom, 2017. Photograph by Andy Stagg, image courtesy of The Mosaic Rooms. Fatma Bucak, Scouring the press, 2016. HD video, colour, sound, 9 min, 20 sec., originally produced by SAHA Association, Istanbul. Fatma Bucak, There may be doubts, 2015. From the series A Study ofꢀEightꢀ Landscapes, 110 x 140 cm, digital archival pigment print from largeꢀformatꢀ film, originally produced by Artpace San Antonio. 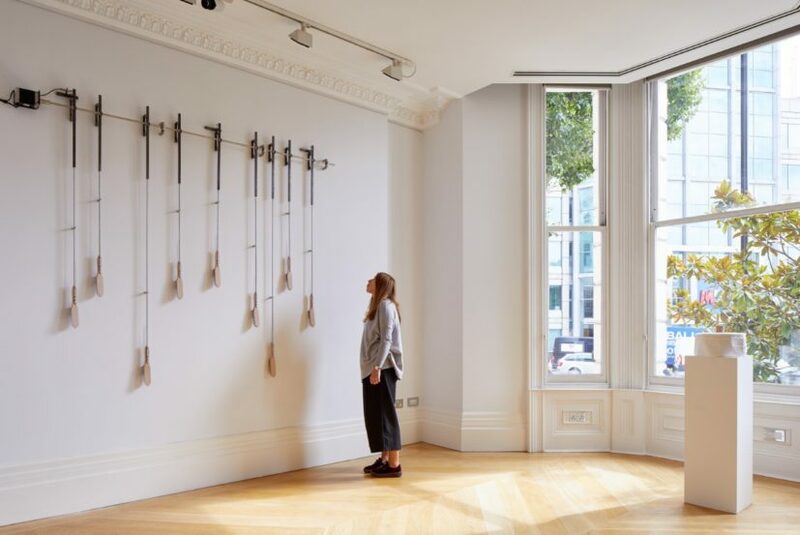 There are two solo exhibitions in London that you may have overlooked during the Frieze frenzy that are closing soon, Fatma Bucak at Pi Artworks and Pascal Hachem at The Mosaic Rooms. I would urge you to see both. 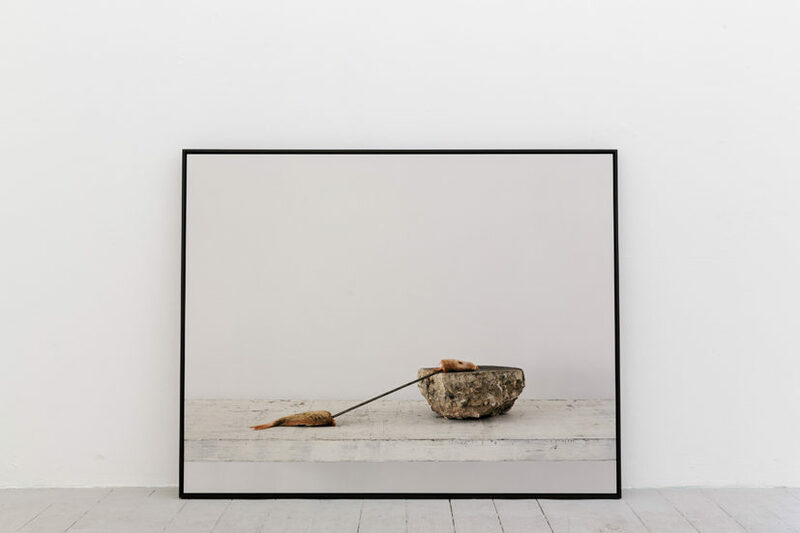 Both artists reflect poetically on the current political climate in their native countries with visual metaphors, found objects and subverted domestic rituals. Their homelands are, respectively, Turkey and Lebanon, both deeply affected by the ongoing conflict in their shared neighbour Syria. These artists pose questions around the use and abuse of memory for political ends. Although rooted in specific contexts, both exhibitions resonate strongly in what feels to me to be a divided and directionless Britain. Hachem’s installations meld easily with the elegant spaces of The Mosaic Rooms in Earls Court, a non-profit organisation dedicated to supporting contemporary culture from the Arab world. 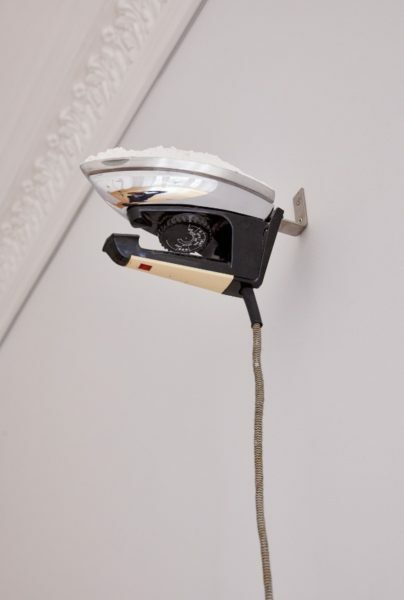 The object that spoke to me most in the lexicon of everyday tools he has repurposed in this exhibition was the clothes iron. 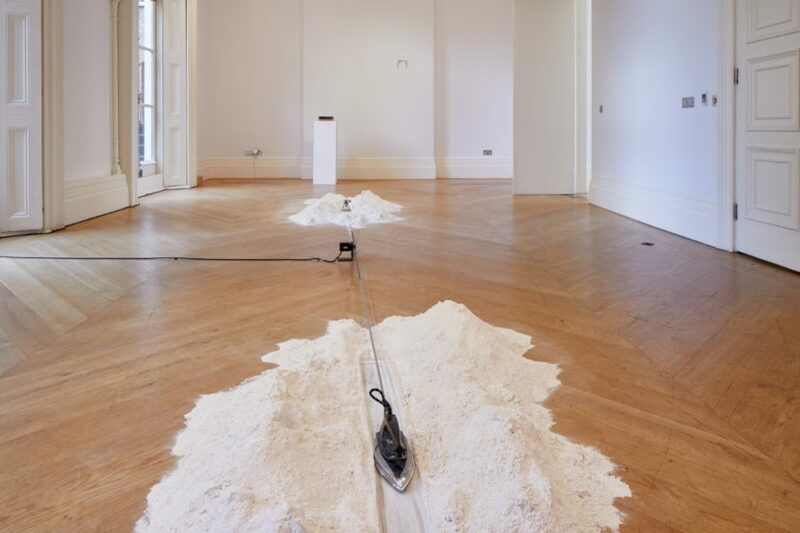 In the main gallery sit two large piles of flour. Embedded in each is a black iron, attached to one another by a metal cord. Facing back-to-back, they take it in turns to plough in opposite directions. When the end of the cord is reached the other takes over. The irons are caught in a Sisyphean, symbiotic relationship: War and Peace, Left and Right; the work’s title is back to square one. A pair of spoons in another room offers a clue, on the left one is written ‘you always want what the other has’, on the other is a black spot. Flour is of course the main ingredient of bread, the food of life, staple of the Arab diet. If the flour is representing the people, the iron is the government. 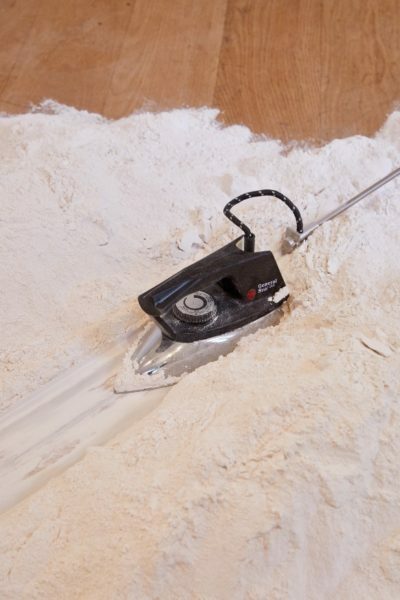 The irons move back and forth flattening and displacing the flour but they cannot fully control it. The artist interrogates the daily instability he experiences in Beirut. Since installing the exhibition, the Lebanese prime minister has resigned under unclear circumstances and has yet to be replaced. Hachem asks how an individual or society remembers its past. In left under, a set of mechanised wire brushes sweep the wall, scratching quietly, revealing concealed layers of paint. I am at once reminded of the contradictory idea of sweeping truths under the carpet and scratching the surface to find the truth beneath, unveiling past crimes. His use of repetitive actions creates a sense of distance and hints at the impossibility of remembering the past in the face of successive events. The body is replaced by a motor and there is a tension between the familiarity of the objects and their uncanny movement. Exhausted aphorisms floated through my mind; Santayana’s “Those who cannot remember the past are condemned to repeat it”; Einstein’s “Insanity is doing the same thing over and over again, but expecting different results”. 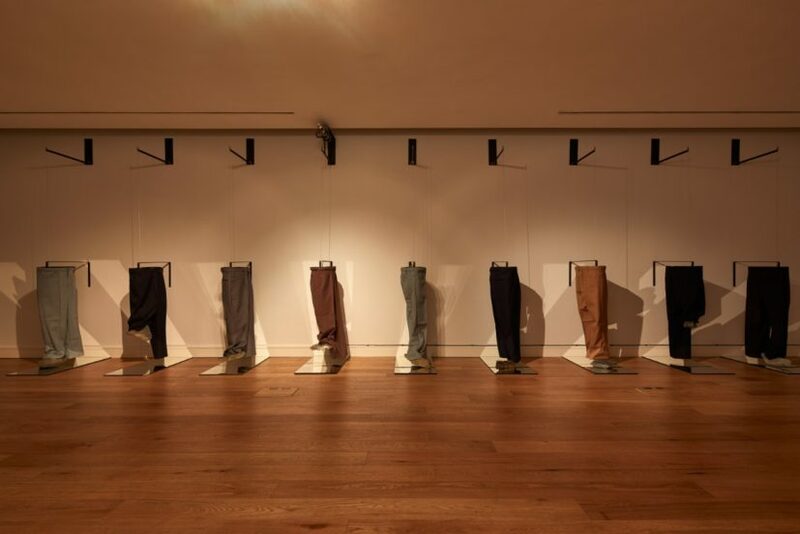 Hachem’s works are open-ended and nebulous, as suggested by the exhibition title’s deliberate enactment of forgetting. 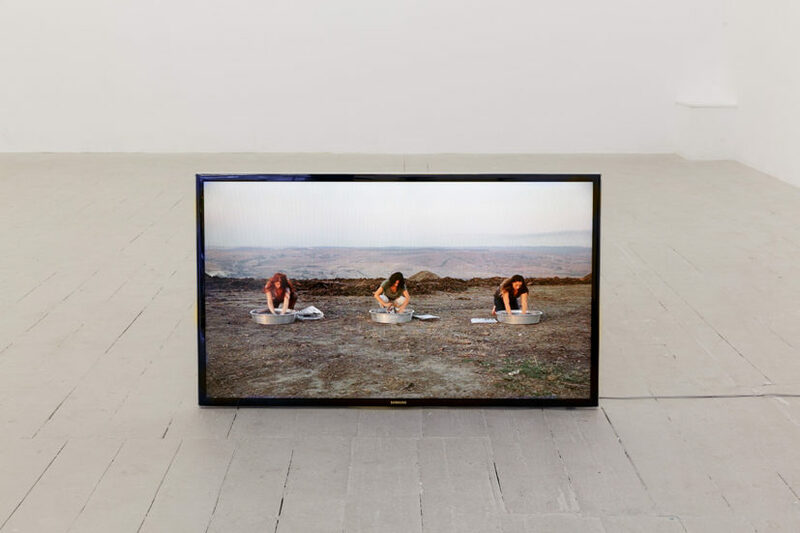 Bucak’s first solo exhibition in the UK, where she studied at the Royal College of Art, takes place at Pi Artworks, an Istanbul gallery that opened its London space on Eastcastle Street in 2013. The exhibition title ironically evokes the familiar children’s rhyme as she addresses themes of freedom of speech in this series of new works. Autocratic regimes view words and cultural production to be as dangerous as violent rebellion and retaliate accordingly. There has been a crackdown on civil liberties in Turkey following the Gezi Park uprising in 2013 and the failed coup attempt of 2016. Bucak’s practice is informed by her Kurdish heritage: the Kurds face an ongoing history of suppression in Turkey. In her work Black Ink she has created a recipe for ink whose ingredients include ash from an incinerated book from a Kurdish publishing house that was burned down. It is displayed with movable type and used in a printing performance throughout the exhibition that is an act of resistance to erasure and forgetting. In a related work, 342 names, Bucak carved the names of disappeared persons in Turkey during the 1980 military coup onto a lithographic stone. The names were added one on top of the other until no more names could fit. The action of writing these names is one of remembrance, a kind of anti-monument. Thirteen prints from one inking of the stone hang on the walls; they progressively fade to nothing. Their illegibility is a tribute to those who remain unnamed. Bucak’s video Scouring the press is a work I find very powerful. Its title suggests looking for something or cleaning with determination. It plays on a screen propped on the concrete floor so that you must crouch, kneel or sit cross-legged to view it. Three women, including the artist, long hair blowing in the wind, kneel behind three metal tubs of water and piles of newspapers. The dramatic backdrop is a mountainside, which gives the women the air of the three sister deities, the Fates who control human destiny. In fact they are on the outskirts of Istanbul, an area primed for development. The women silently work their way through 12 weeks of newspapers, scrubbing them, wringing them out like garments and placing their balled up forms on the ground. We are reminded of the power of water, apparently gentle, to destroy as effectively as fire. The work is produced in the context of the aggressive repression of the free press by Turkey’s ruling AK party, the women representing censorship. To me, however, this performance also represented a fantasy of washing away the pernicious influence of the hate-mongering section of the press in this country; or expunging the bad news of recent years and resetting the equilibrium. Again the use of a familiar, domestic action works as an effective and instinctive metaphor, based in specifics but open to interpretation. Something of their actions also suggests mourning, the physical labour of repression, whether it is political or personal. The fragrant Damascus rose was first introduced to Europe by returning crusaders and is the ancestor of most European roses today. Its history carries traces of conflicts past and complicates notions of belonging, home and origin. 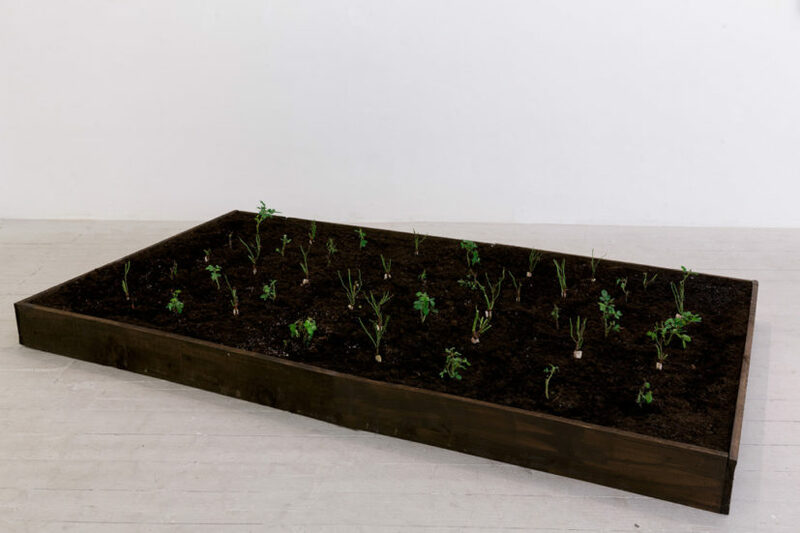 In the gallery sits a box of earth containing forty small Damascus rose plants that reached London from the Syrian capital via Beirut, Bucharest and Amsterdam. Upon arrival half were grafted onto European roses and half remained as is. At the time of writing the grafted ones are growing best. This ongoing work Damascus rose offers an opaque metaphor for the plight of Syrian refugees. The therapeutic gesture in caring for the roses is imbued with hope that humanity will prevail in dark times. These artists comment on our fractured present, where nationalist movements seek to shrink us intellectually and geographically. They remind us of the fragility and resilience of life; calling on us to stay alert, not to give in to cynicism and insularity.